When our Design Director, Stephanie, and her husband Eric began looking for a new home, they each had their own, non-negotiables in mind. Eric wanted to make sure they stayed within their set budget, above all else. He also wanted the house to be close to downtown Bexley, with easy walkability to local restaurants and bars. Stephanie wanted a house that had plenty of potential. She knew she wanted to do some "light" renovating... nothing too serious. The couple had lived in their previous home for several years, during which time Stephanie had very slowly designed each room to fit her unique aesthetic. She had made that a house a home, but it had taken a few years to get there. For this house, she wanted a quicker turn around and needed whatever house they chose to have a good foundation from which to start. As Eric and Stephanie searched for their new home, they failed to find a place that really spoke to both of them... until they visited the house that would very soon become theirs. Built in 1927 by a man named "Buzzy", the 91 year old house had only been owned by two people: Buzzy, and then his niece. Unfortunately, the house had fallen into disrepair and was in need of a *lot* of T.L.C. In fact, when Stephanie and Eric stopped by for the open house, they observed couples walking just past the threshold of the home and then immediately fleeing the scene. That didn't bode well. When they entered the home, they saw why the house wasn't doing well on the market. Cabinets in the kitchen were falling off, the floors needed to be refinished, there was teal carpet on the stairs that desperately needed replacing, paint was peeling on the walls, and more. And, of course, the house's wiring was all 'knob and tube,' which isn't insurable. So that would all need to be replaced, too. Stephanie immediately fell in love. Eric, however, needed some convincing. Our Design Director, Stephanie, at home in her newly remodeled century-old house! Stephanie saw that this house had gorgeous original french doors, hardwood floors, unique hardware, lots of natural light, and most importantly, tons of potential. Plus, the house's asking price was $200,000 less than their set budget. While she'd originally been interested in undertaking a light remodel, this house needed a massive, full scale gutting. After crunching the numbers, and discussing Stephanie's vision for the house, Stephanie and Eric decided to dive in and put in the work that the house so desperately needed. Stephanie began what would ultimately be an eight month project by following the same process she follows when working with a client: She made a Pinterest page, collected inspiration photos from Houzz, and created a design presentation for herself. Stephanie's design presentation is below! Check out the images that inspired her! 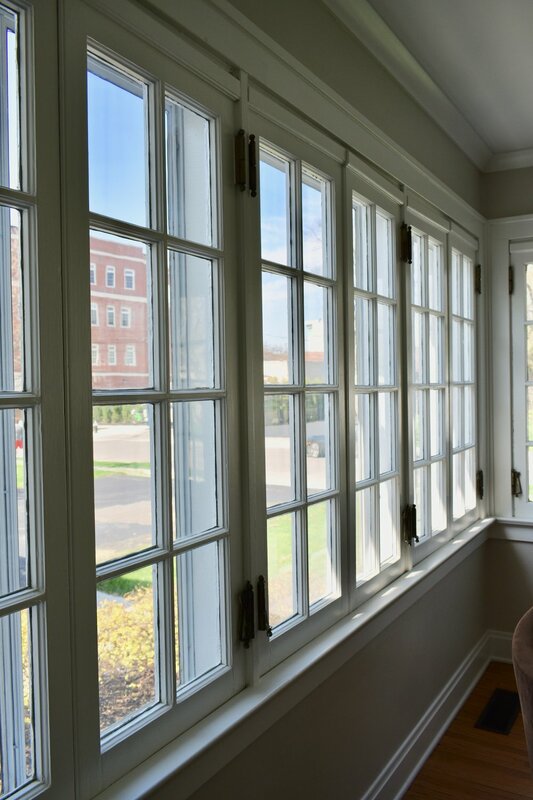 Stephanie was instantly drawn to the original french doors in the house, so she wanted to make sure she brought new life to them, while still honoring their original use and build. 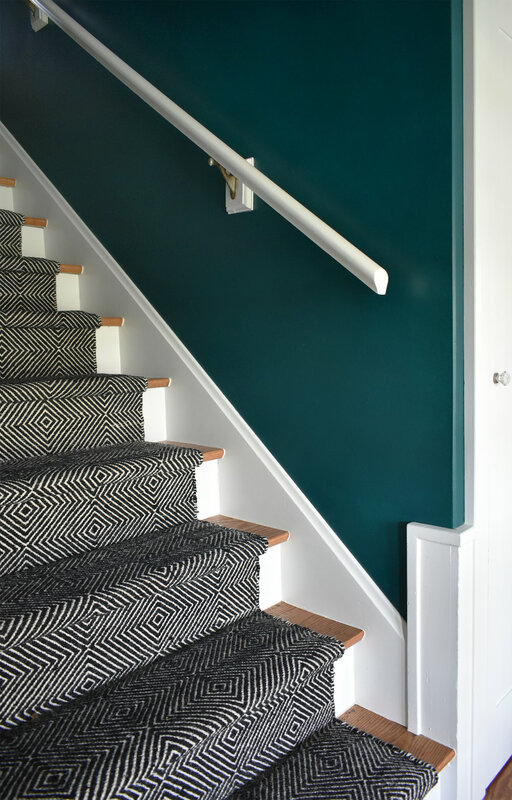 She also wanted to make the front stairs bold and inviting, rather than drab and dated. After all, the foyer introduces visitors to the home! After the remodel was complete, Stephanie felt like the whole house was smiling. Starting with, the foyer, of course! In the living room, Stephanie's main goal was to lighten and brighten the space, while honoring the house's historical touches. She painted the walls and the french doors a soft white, as well as the fireplace's bricks. 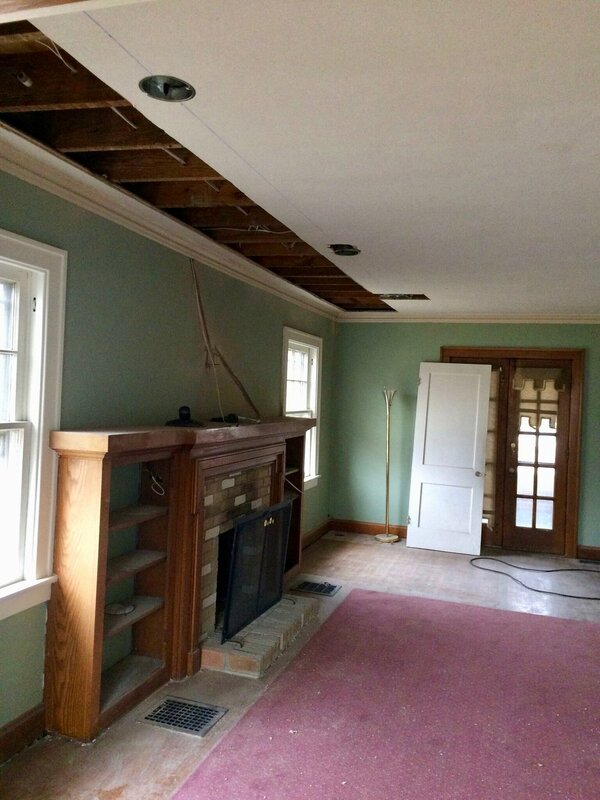 Click through the slide show below for some before and afters of the houses's fireplace! It was important to Stephanie that the room feel bright and happy. Her personal style is very light, airy, and whimsical. When you're in the newly renovated living room, you can feel that in spades! 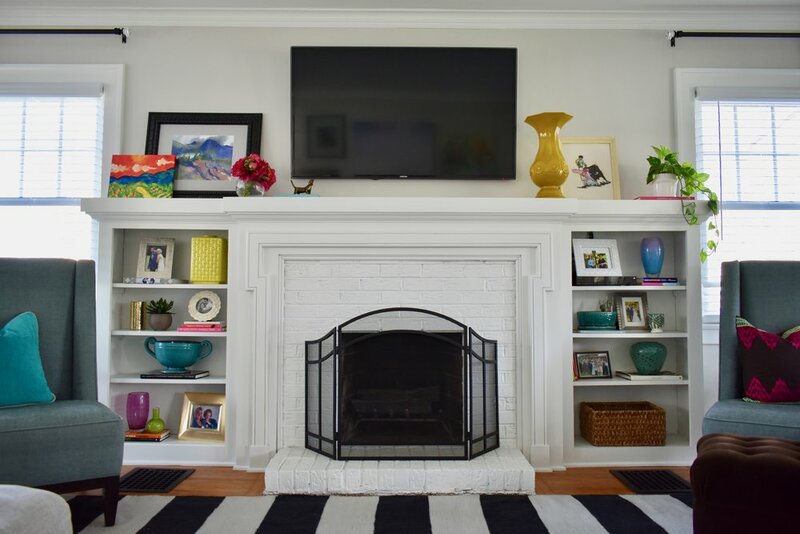 Click through the slide show below for before and afters of Stephanie's living room! Throughout the home's living room, Stephanie has sprinkled pops of color and beautiful transitional pieces that really make the room "smile." 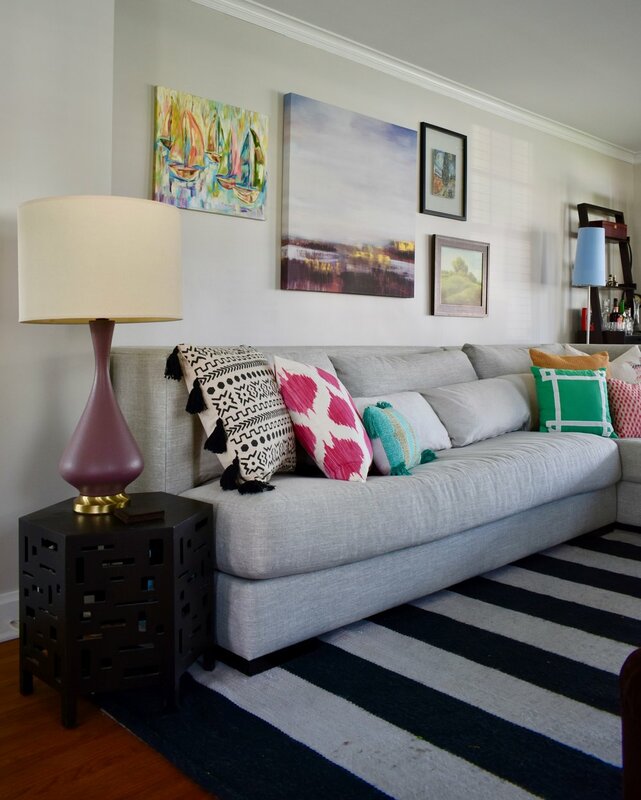 A full view of Stephanie's light, bright, and airy living room! There's nothing like a collection of greenery to brighten up a space! Stephanie wanted to bring the inside, in. And what better way than with a selection of plants? The amazing, original french doors separating the living room and dining room can be opened up to create a larger space, or closed to create discreet living spaces! Check out this original, 1927 hardware! The kitchen was a particular challenge. It was incredibly narrow, the cabinets were coming off their hinges, the paint was peeling, and it wasn't very functional. 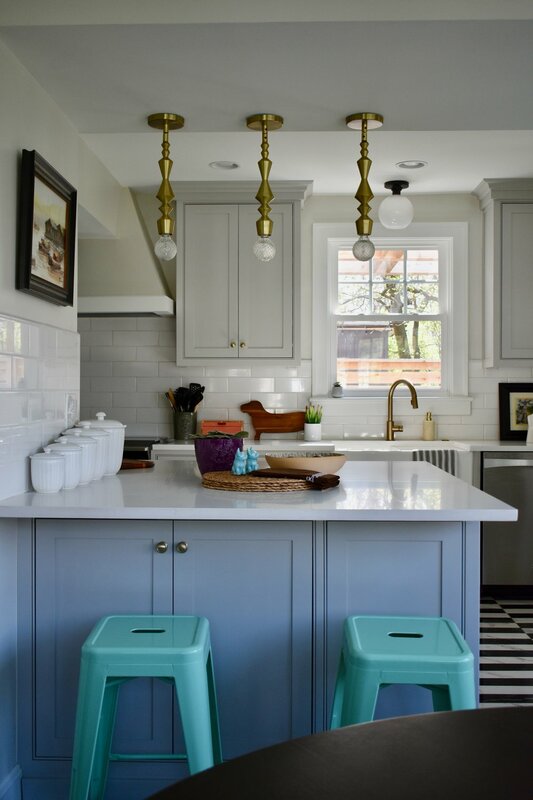 Click through to see the dramatic kitchen transformation! Stephanie knew that she wanted a bold floor. 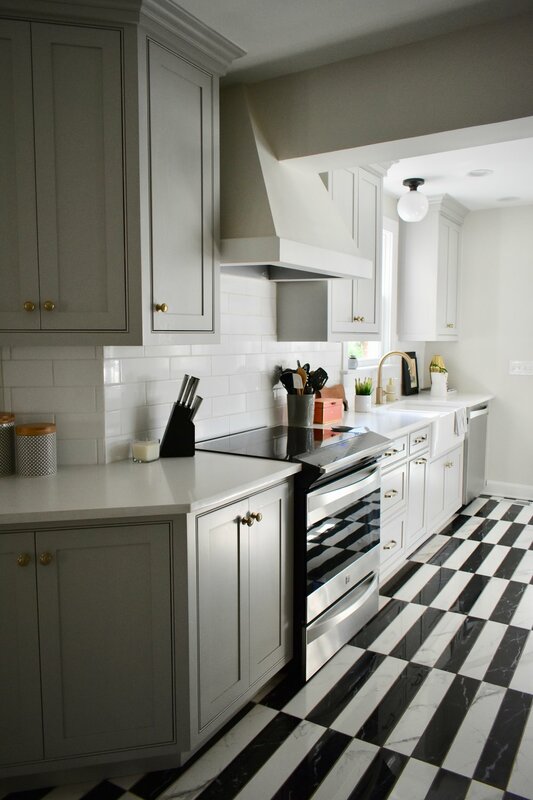 She loves black and white (in her last home she had black and white cabinets) and after seeing these elongated, porcelain subway tiles on Pinterest, she knew they belonged in her kitchen! But with a bold floor tile, you need to find balance in the other design touches! Instead of using white paint for the cabinets and built-ins, Stephanie opted for a warm, soft grey. To add additional warmth to the space, Stephanie selected gold fixtures and hardware. When it came to choosing the shape of the hardware, Stephanie decided she wanted more classic pulls to help solidify the kitchen's inviting, transitional feel. In order to create more functional space, Stephanie and Eric had to knock down two walls! This helped open up the kitchen, left room for more cabinet space, and created a real sense of flow between the kitchen, front sitting room, and the powder room. One of the kitchen's best features: the farmhouse sink! Stephanie wanted a big, working open surface in her kitchen. Instead of a island, she put in a peninsula. Instead of marble (which is porous and can stain), Stephanie chose a quartz material for the peninsula's surface. It's the perfect size to prep food, display flowers, and entertain around. To add more light and movement to the space, Stephanie decided to connect the mudroom to the kitchen. It had previously been closed off with a small door. She continued the tile into the mudroom, too, creating a great continuous feel. A dramatic before and after of the kitchen's cabinetry! In the dining room, Stephanie wanted to lighten the space, while keeping the amazing original windows. She painted the walls and windows white, while leaving the hardware as it was. The hardware on the dining room's original windows were too gorgeous to get rid of. They're still functional, and ever so unique! She also wanted to install a real statement piece for the light fixture. When Stephanie and Eric purchased the house, there was a very small powder room on the first floor. It was oddly shaped and hard to maneuver. When designing the downstairs powder room, Stephanie wanted to make the space funky, and modern. The vanity was made from a converted dresser from West Elm and the tile used in the kitchen was used in the powder room as well, to create a feeling of continuity. If you can believe it, the second floor of the house didn't have a second bathroom! Instead, there was an office space that had a wall lined with windows. 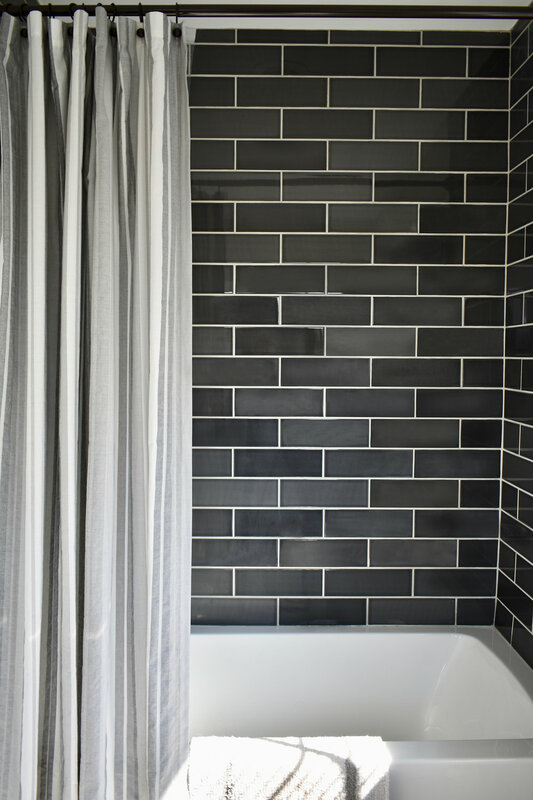 When Stephanie considered the space, she decided she wanted to divide the space into a newly constructed guest bathroom, as well as a second floor laundry room, both flooded with natural light. Since everything on the first floor had a light, bright feel, Stephanie wanted the upstairs bathroom to feel more dramatic. 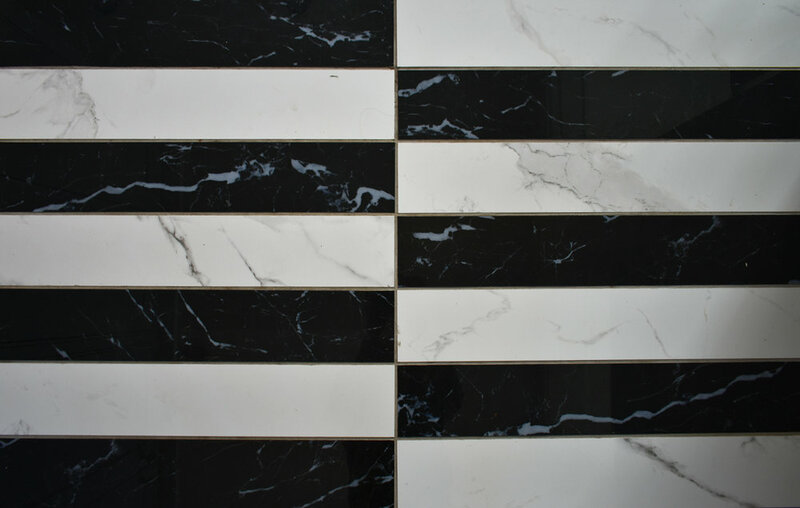 She selected a dark vanity and dark tiles for the shower. 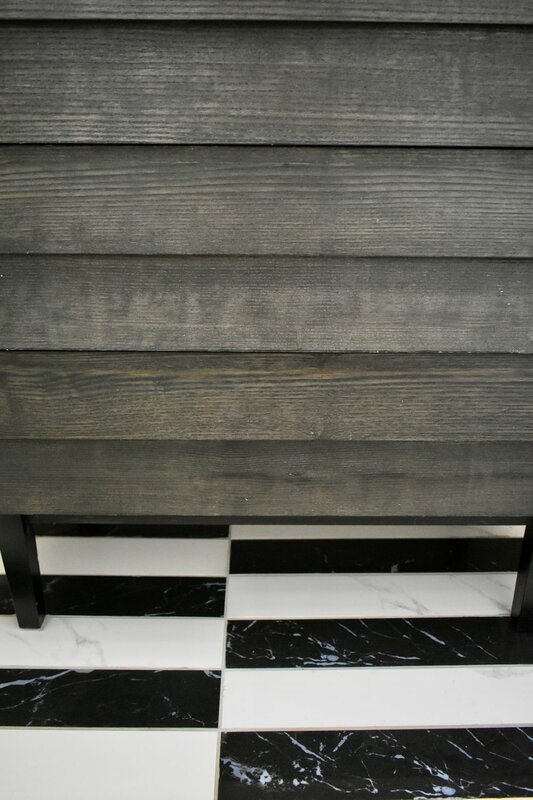 She chose textural ceramic tiles for the floor as well that, on first glance, look like fabric! For the vanity mirror, she chose a large circular mirror that would draw attention away from the fact that the windows are just slightly off center (oh the quirks of an historic home!). Brass drawer pulls and hardware finish off the look! The results of this massive total remodel are stunning, to say the least. But what does it take to do it, yourself? For people considering taking on a remodel or renovation project, themselves, Stephanie has some words of advice! 1. Be confident in your decisions: Trust your instincts. You are the expert on the things you like. People get in trouble when they ask too many people for advice. I see this happen with clients all the time. They make a decision, then ask all of their friends what they think, and then end up second guessing everything they've already chosen! So be confident in your decisions. You know what will make you happy! 2. Know and stick to your budget: This is so important! Know. Your. Budget. And stick to it, as best you can! So when you go shopping for tiles, tell the salesperson up front what your budget is. The last thing you want to do is fall in love with something that's totally out of your budget. Also, decide ahead of time what you want to splurge on. Is there a couch you've had on your wish list? Are you obsessed with a specific floor tile? Do you want to put in new flooring? Decide ahead of time where you're willing to spend more money so you don't accidentally blow your budget. 3. Expect to go slightly over budget: So you know your budget, you've stuck to it, but something unexpected comes up! Make sure you have an overflow fund, just in case. You never know what can happen when you're remodeling. If you have an overages fund, you won't have a last minute panic or a scramble for funds! 4. When you work with a contractor, ask for realistic allowances: This is so important. Contractors can sometimes give you timelines that are too optimistic. Ask your contractor for an honest and realistic allowance so you know what to expect. 5. When redesigning a home, try to stay true to the house's character: If a house has good bones or hardwood floors or amazing french doors, try to keep them and refinish them. They'll add instant character to your space and you'll feel like your living in the home is adding to the house's history in a positive way! 6. If you love something, just do it!